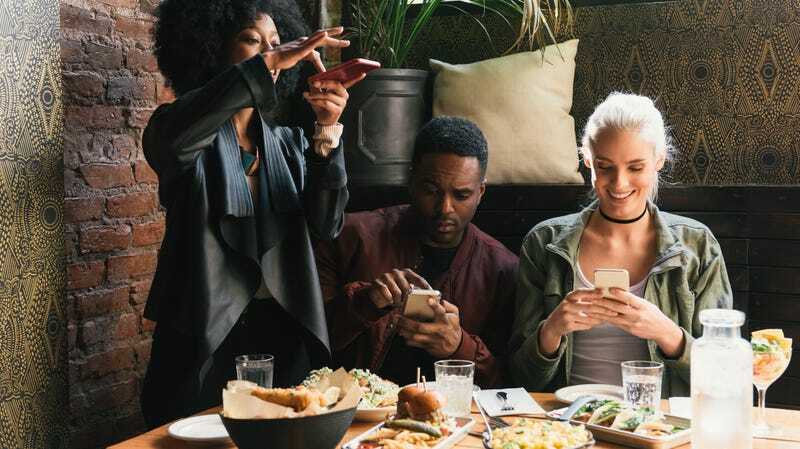 It’s no secret that restaurants and bars these days make decisions based on what’s going to look good on customers’ social media feeds. Patterned wallpaper, catchy neon signs, elaborately garnished cocktails, avocado toasts... they’re all visual details acting as complete Instagram bait. But one Boston steakhouse is taking this further: Boston Chops’ new location includes a dedicated “Instagram table”—with adjustable, temperature-variable lighting—for social-media influencers. Forbes reports the custom furniture cost $10,000 to construct, an expense the owners obviously feel was worth it to create what they call the first Instagram table in the country. Planning for the table involved the owners meeting with architects and “social media influencers”—quasi-bloggers who are compensated by “brands” to post about their “lifestyles” on social media—to design the Platonic ideal of a restaurant photo experience. (There are not enough air quotes in the world for this story, honestly.) These influencers aren’t journalists or photographers or celebrities in the traditional sense; they’re essentially good-looking people who take really nice photos, amassed a ton of followers, and somehow turned this into a pseudo-occupation. I guess they’re able to pay their rent in gratis Unicorn Frappuccinos? The table features lights on moveable arms, plus lighting whose temperature and intensity can be manipulated to achieve the perfect shot. This special seating can be reserved by request. The rest of the restaurant also was designed with “Instagram-able moments” in mind—including eye-catching backdrops, art, signs, and other design elements. “Now, it is imperative that photos of restaurant interior and food are beautiful when they are posted online by influencers. It is a great marketing tool for people to see our food, decor, and cocktails, and hopefully entice them to check it out for themselves,” chef-owner Chris Coombs said in a release quoted by The Boston Globe. Hey, I like Instagram myself, but I am obviously way out of touch with Kids These Days, because the main criterion I use to choose a restaurant to friends is uh, whether the food is good? I’m looking for a restaurant, not a Pinterest board.